1765-1857. Born on 7 May 1765 at St. Peter Port, Guernsey, he was the second son of Colonel Joshua Gosselin of the North Regiment of Militia on that island, and of his wife, Martha Le Marchant, who was also from Guernsey. His brother was General Gerard Gosselin, whilst two other brothers, Corbet and Charles, the one a lieutenant in the Navy, the other a lieutenant of the Army, died at Trinidad in 1803. His nephew, Joshua Carteret Gosselin, a son of another brother, Joshua, was born in 1789 and became a lieutenant in the Navy in 1810. On 2 August 1778 Gosselin entered the service on the Actaeon 28, Captain Philip Boteler, removing with this officer to the Ardent 64 in June 1779. He was aboard the Ardent when she was captured by the Franco / Spanish fleet off Plymouth two months later on 16 August during the Channel fleet’s retreat, having anchored amongst the enemy during the middle of the night. He was released from imprisonment at Alençon three months later. In October 1780 he joined the Barfleur 98, Captain John Inglefield, taking the flag of Rear-Admiral Sir Samuel Hood out to the Leeward Islands. After being present at the capture of St. Eustatius on 3 February 1781 he fought at the Battles of Martinique on 29 April and St. Kitts on 25 January 1782. 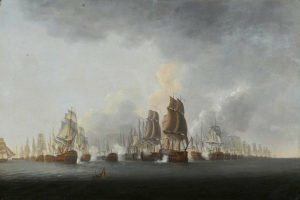 Upon transferring to the Champion 24, Captain Alexander Hood, he then fought at the Battle of the Saintes on 12 April 1782, and he returned to England in the following year with Captain Hood aboard the newly commissioned French prize Aimable 32. Following the peace Gosselin continued his career with the Chatham guardship Carnatic 74, Captain Anthony James Pye Molloy, and then serving off Africa aboard the sloop Nautilus 16, Commander George Tripp, with whom he removed on that station to the Grampus 50 following the death of Commodore Edward Thompson in March 1786. Returning home, he served at Portsmouth aboard the Triumph 74, Captain John Knight with the flag of Rear-Admiral Lord Hood, and Barfleur 98 in 1787 with the same officers. He was commissioned lieutenant on 1 December 1787. After sailing for India with the Cornwallis Expedition in February 1789 aboard the Atalanta 14, Commander Maurice Delgarno, Gosselin transferred on that station to the Crown 64, Captain James Cornwallis, flying the broad pennant of Commodore Hon. William Cornwallis, with whom he later removed to the Minerva 38. He was promoted commander of the hired brig Dispatch on 23 April 1793 before returning to England, the brig having reverted to the ownership of the East India Company. On 19 March 1794 he was appointed to the sloop Kingfisher 18, initially based in the Downs, in which he was present at the Battle of the Glorious First of June in 1794. He assisted at the capture off Belleisle of a French convoy out of Bordeaux by Vice-Admiral Hon. William Cornwallis on 8 June 1795, and was sent home with the prizes before Cornwallis’ celebrated retreat on 17 June. Gosselin was posted captain of the Brunswick 74 on 23 July 1795, serving in an acting-capacity for Captain William Browell through to September, and on 22 April of the following year he was appointed to the eighteen-pounder Diamond 38 in succession to Captain Sir William Sidney Smith, who had been captured by the French. Commanding this frigate, he assisted the sloop Rattler, Commander John Cochet, in the capture of the French privateer Pichegru 10 off Cherbourg. 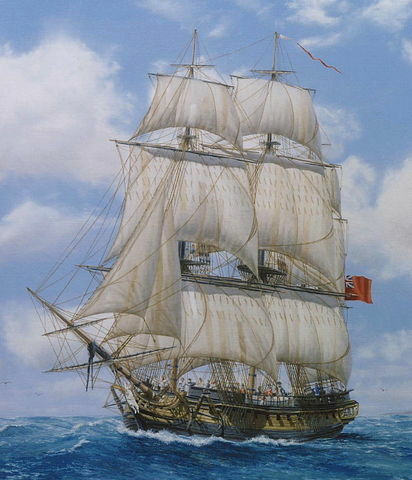 On 25 July 1796 he was appointed to the twelve-pounder frigate Syren 32, in which he took the privateer cutter Sans Peur off Cherbourg on 2 February 1797, but in which he was with the Channel fleet at the time of the Spithead mutiny on 16 April before being placed under the orders of Commodore Sir Richard Strachan off France. Following a refit in the winter at Portsmouth he took a convoy out to Jamaica in March 1798, and was presented with a valuable sword by the merchants for his protection of their trade. Whilst on this station he served at the reduction of Surinam on 20 August 1799, and his boats with those of the Daphne 20, Captain Richard Matson, destroyed a 7-gun privateer at Cayenne in August 1799. After returning to England with another convoy the Syren undertook a brief cruise off Havre de Grace prior to a laborious three month stint off Weymouth in attendance on the King during the summer of 1800. Gosselin then took a convoy to Cork that winter and was sent out with a further convoy to the West Indies during February 1801. He remained on the Jamaican station until the peace, during which time, in October 1801, he took passage in the Merlin 16, Commander John Child, to assume command of the Melampus 36 from the indisposed Captain Graham Moore off Vera Cruz in the Gulf of Mexico. The Melampus was paid off on 23 June 1802 after he brought her back to England with Rear-Admiral Robert Montagu a passenger. Gosselin’s next appointment did not occur until February 1804, when he became the flag captain to Admiral Hon. William Cornwallis on the Ville de Paris 110 off Brest, the ship having been recommissioned by Captain Tristram Robert Ricketts. In May he was appointed to the Argo 44 serving in the Mediterranean, but it is not clear whether he took up the appointment, for in August he was instructed to recommission the frigate Latona 38 at Deptford. During November he sailed from Portsmouth to join the Channel Fleet, and in the following March he brought the Latona into Plymouth carrying one hundred and ninety-five thousand dollars that had been taken out of a Spanish capture. During the same year he commanded the inshore squadron in the Channel, taking the Spanish privateer Amphion 12 which was only three days out of San Sebastian on 22 October 1805. Early in 1806 there was some concern that the Latona might have been lost whilst cruising with the Dragon 74, Captain Edward Griffith, but news was gratefully received that they were safe in the Bay of Biscay. In July 1806 the Latona arrived at Plymouth after a five month cruise before sailing to join the Channel Fleet off Brest. Gosslein now commanded the Audacious 74, to which he had been appointed some months previously, serving under Rear-Admiral Richard Strachan in the Channel, and during the search for Rear-Admiral Willaumez’ squadron, in the course of which duty his ship was dismasted in a hurricane and left Plymouth for Portsmouth in early October for repairs. The Audacious was based in the Channel during 1807 and after serving under the orders of Commodore Sir Richard King off Ferrol that winter Gosselin escorted General Sir John Moore’s army to and from Sweden in the early summer of 1808. In August 1808 he proceeded to the Tagus in command of a squadron conveying troops to Portugal, and he was employed in the embarkation of Moore’s army following the Battle of Corunna on 16 January 1809. After returning home from Portugal Gosselin resigned from the Audacious in March 1809, the month of his marriage, and he was unable through poor health to accept the command of the brand new Cressy 74. He was advanced to the rank of rear-admiral on 4 June 1814, vice-admiral on 27 May 1825 and admiral on 23 November 1841. Most controversially he was denied elevation to the rank of admiral of the fleet following the death of Sir Thomas Byam Martin in 1854, despite being at the head of the admiral’s list. It is possible that this slight was because he had been on half-pay for the best part of half a century. Despite erroneous notices in the press of his demise in May 1857, Gosselin eventually died on Jersey on 27 November. A memorial in his honour was erected at St. Leonard’s Church, Bengeo, Hertfordshire. Following his career in the Navy Gosselin sat as a magistrate in Hertfordshire whilst also playing a full role in London society with his daughters, and later being a visitor of note to Brighton.